Hi, my name is Jes, and I have an addiction. No, it’s not alcohol or drugs or food (wait, that last one might be accurate). Ok, I’ll confess, it’s River’s “I-Don’t-Have-Time-For-a-Yeast-Dough Whole Wheat English Muffin-ish Stove Top Buns.” I’ve made them three times in one week (yes, I eat that much bread; yes, I know it’s probably not healthy), tweaked the recipe a bit for what’s easier for me, and I can’t stop thinking about them. I mean, they’re SO easy and SO quick and SO deicious with apple butter and peanut butter swirled together on top. They even make great buns for Sweet Potato and Black Bean Burgers. I bet they’d make great personal pizzas too (anyone else do that with English Muffins back in the day or is that just me?). The question remains, is there anything they can’t do? You guys should go ahead and make them and report back to me on that one. And without further ado, English Muffinish Buns! Combine the soy milk and water and heat them up to 110 degrees F. Add the oil to the soy milk and water. Stir the water mix into the dry mix. Knead the dough in the bowl for a minute or two. Remember, we don’t have time for a yeast dough, so forget all the kneading. Let the dough rise for 30 minutes. Spray a 10 inch sauté pan with cooking spray and turn the stove on medium-low. Take six chunks of dough and form them into balls. Flatten them to about an inch high and place them on the prepared sauté pan. Cook covered for 15 minutes or until bottoms look brown. Gently flip each bun helping yourself with two forks and cook on low-medium uncovered for 5 to 10 more minutes until bottoms are brown. 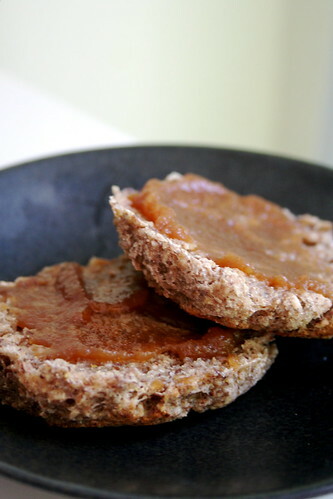 Serve with Earth Balance or apple butter or your favorite topping! mmm, great idea! i definitely have to try out this recipe. 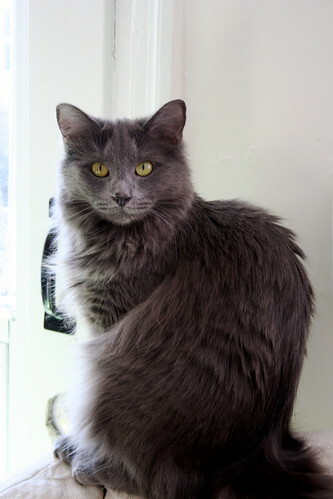 Dorian Gray = one pretty kitty! i love her name, too! dan & i have yet to make english muffins – and we really need to. i think we’ll try these addictive muffins. easy ‘n awesome = the best! mmmmmmmmmmm! i need to get some more apple butter, too – or make some. jeez, that stuff is sooo good! those look fantastic! as does your adorable kitty. i bet those muffins would make awesome personal pizzas though… i made one out of a ciabatta sammich roll the other day and it ruled. i love mini pizza. mmm. I am so excited that you posted about this! I have had an English muffin obsession lately. I would love a fast recipe, maybe too much. Aww, I love your kitty, she’s so cute! The oat bran and the wheat germ makes them look really fantastic! Dorian Gray is looking so grown up now! Pretty kitty! First of all, your kitty is beautiful! I missed those buns on River’s blog. They look terrific. Thank you so much for the shout-out! I’m so glad you also love these things! Oh, and I have made little pizzas with them and they were yummy! Dorian Gray is such a gorgeous kitty! He’s really posing for you too. Does he have a little portrait hidden somewhere, that reflects whenever he claws the couch or jumps on the kitchen counter? PS: I just remembered that The Picture of Dorian Gray was in the background of my English Muffinish picture! Sister posts! I totally remember toaster oven English muffin pizzas! I have been wanting to try these, but their addictive nature is making me a little afraid! The stovetop buns look marvelous. I wish I had a few right now with some tea! I think I will pair these with your sweet potato & black bean burgers – how perfect! I used to eat english muffins all the time, I don’t know what happened, but these look delicious! And I am definitely going to try your recipe for English Muffinish Buns, thanks. Found my way here from River’s place. Dorian Grey is so BEAUTIFUL! !